The Center for Judaic Studies has awarded Kerry Carnahan (Department of English) with the Cohen Henes Graduate Fellowship for her summer research. Kerry will be working on her PhD dissertation project: a new translation of the Song of Songs accompanied by an exegetical commentary. The Center for Judaic Studies is proud to announce our 2018 undergraduate award winners for Hebrew and Judaic Studies. The awards were presented at the Department of Literatures, Cultures, and Languages annual student award ceremony. With the support of the Graduate School, the Center for Judaic Studies has awarded Center Graduate Assistant Adane Zawdu a predoctoral fellowship for his summer research. Congratulations, Adane! Congratulations to Corey Frate who received the Sylvia and Leo Dashefsky Prize for Excellence in Judaic Studies in recognition of his academic achievements in Judaic Studies as well as the exemplary engagement he has shown in the classroom. The award was presented at the annual Literatures, Cultures, and Languages Achievement Awards ceremony. Mazel Tov! The Center for Judaic Studies and Contemporary Jewish Life is proud to announce the recipients of the 2017 Israel Academic Travel Awards. The awards are sponsored by the Center for Judaic Studies, Global Affairs, and the Middle East Studies program. Each student was awarded $1500 to defray the cost of their summer academic travel to Israel. Miriam Katz will be working at Tel Aviv University in the lab of Dr. Yossi Shiloh. Dr. Shiloh’s lab examines the neurogenetics of aging in hopes of one day being able to prevent or reverse the mental changes that come with old age. The internship is part of the Career Israel program in partnership with Onward Israel. Nathan Schachter will be interning with The Jewish Agency’s Israel Shilchut (Israeli Emissaries) program through Onward Israel. Nathan will be assisting in the emissaries’ training to help prepare them for their time abroad. Shelly Silver will be interning at Zeekit, an Israeli startup that reinvents the way consumers browse, share, and shop from their mobile devices. Shelly’s internship will focus on marketing and communications within the company. The internship is in partnership with Onward Israel. With the support of the Graduate School, the Center for Judaic Studies has awarded four, faculty nominated, graduate students with $1500 predoctoral fellowships for their summer research. Congratulations! My project is based on 17 months of ethnographic fieldwork in Israel, in which I explore the different ways Ethiopian-Israelis’ gain group distinctiveness in three different contexts: everyday lives; State institutions and bureaucracy; and political mobilization. More broadly, I look at processes, mechanisms, and practices that structure why and how certain categories of difference become consequential for social relations and political mobilization, while others do not. My project reconstructs Adriano Lemmi’s activities and position in the clandestine networks that funded revolutionary leaders during the period known as the Risorgimento, explaining why this Tuscan merchant was willing to commit his money and influence to fund revolutionary nationalist projects aimed at unifying Italy and secure its political independence. While scholars have disagreed about whether or not Lemmi’s family was Jewish, it is clear that both in Livorno and in Constantinople he came into close contact with many Jewish merchants who were part of wide-reaching business networks. Relationships cultivated with these Jewish merchants were instrumental to the success of Lemmi’s mercantile activities, yet they remain largely unexplored. My project undertakes a study of contemporary Syrian literature within the context of modern trauma studies. This summer I will be preparing for my comprehensive examinations in the fields of trauma studies, war literature and testimony, and contemporary Arabic literature. My project is to undertake a new translation of the Song of Songs accompanied by an exegetical commentary. This summer I will prepare a scholarly word study on the Song, explore its Kabbalistic interpretations, and immerse myself in the ancient cultic origins of the text. Global Affairs, Judaic Studies, and Middle East Studies are pleased to announce the Israel Academic Travel Award winners for the summer of 2016. Each student was awarded $1500 to defray the cost of their summer academic travel to Israel. Jordan Angel: I will be working for Dynamic Shipping as a Finance Intern, spending my time doing academic research about new energy resources and renewable energy. Yarden Canaan: I will be interning through the Onward Israel program. I expect to be assigned to the Venture Capital firm, ELEVATOR, in Tel Aviv, where I will be called upon to use my skills as an Economics and Applied Math major. Jennifer Jacobson: I will hold an internship at the Hebrew University's Harry S. Truman Research Institute for the Advancement of Peace. During my internship, I will be assisting Dr. Micha'el Tanchum in his political research, focusing primarily on European Relations with Middle Eastern countries and particularly how the refugee crisis is altering these relationships. We look forward to hearing about our awardees' experiences when the return! Congratulations to our student award winners who were presented with awards at the recent Literatures, Cultures, and Languages Achievement Awards ceremony. Kerry Carnahan was awarded the Cohen and Henes Award for outstanding senior scholar in Hebrew and Judaic Studies. Lea Anne Toubiana was awarded the Sylvia and Leo Dashefsky Family Prize in recognition of excellence in second year Hebrew. Lorraine Gordon was awarded the Frances and Irving Seliger Memorial Award in recognition of excellence in Holocaust studies. Congratulations to Naila Razzaq for her CLAS awards and recognition! Congratulations to our graduating senior, Naila Razzaq for the being nominated and recognized in the CLAS Graduating Senior Stories for her accomplishments. 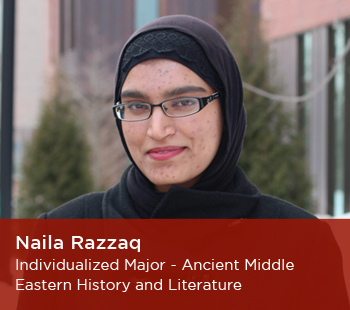 Naila is now featured on our “Introducing the CLAS Class of 2015” page highlighting her experiences and achievements while at UConn.